In Woodstock, GA, we’re eliminating anxieties about a trip to the dentist office. Our waiting-room furniture might be standard-issue, but it’s the people and the technical equipment in the back that really matter here. We’re The Woodstock Center for High-Tech Dentistry for a reason. For over three decades, Dr. John K. Dooley, along with his staff, has stayed up-to-date on his knowledge of the latest in dental treatments and technologies of the digital dental world. That’s important to you because it means your trip to the dentist is better than ever. It’s more comfortable and more convenient. Less messy, less painful, and less time-consuming. Need a crown? We’ll have you in and out the same day, wearing it. Done. No second appointment needed. Does your procedure call for an impression? Forget powders or pink goo; we use a very small camera for precise 3D imaging, instead. What’s even more amazing (dare we say, fun) is that you can watch your own restoration materials, like crowns, being created by one of our Cerec® milling machines. This technology has changed dentistry forever, and it’s right here just three miles from downtown Woodstock. • Crowns – in just one visit! We have extensive experience dealing with most dental insurance plans, and offer no- or low-interest payment options through CareCredit. We also accept Visa, MasterCard, AMEX, and Discover Card payments. Call us at 770-924-1657 (or click below) and set up an appointment for a new-patient examination and cleaning. Let’s start a great relationship to maintain your personal dental health and to end that dread of going to the dentist. Chances are, you’ve never met a dentist like Dr. Dooley, whose chairside manner is uniquely good-natured. His goal for you: Always gain agreement on what he’s doing for you, and why he’s doing it. Since setting up practice in Woodstock in 1985, Dr. Dooley has continued to invest in and master new dental technologies to create ever-better experiences and outcomes for his patients. Having new equipment is one thing; being an expert at new techniques is another. Dr. Dooley and his team provide superior care and hone their skills regularly through continuing education. It might sound like a cliché, but the family-like staff at the Woodstock Center for High-Tech Dentistry is a tight-knit group, all committed to making your dental visit a memorably pleasant one. BRIDGES are the conventional way to replace missing teeth. 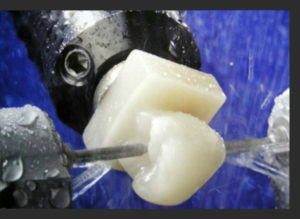 Teeth on each side of the space are prepared, an impression is made, and the impression is sent to a lab. The lab makes a custom-fit bridge and then we permanently cement it in place. BRUX appliances are for patients who grind their teeth, causing them to fracture or break. These appliances prevent tooth wear. CEREC® one-visit crown technology allows Dr. Dooley to complete a ceramic crown, onlay, overlay or veneer restoration in one visit instead of two. This CAD/CAM technology uses leucite-reinforced porcelain, so your smile won’t be discolored by silver fillings. DIAGNOdent® is a laser used to detect decay in a tooth at the earliest stage, allowing us to preserve the structure of the tooth. ENDODONTIC treatment (root-canal therapy) is required when tooth decay causes an infection of the dental pulp. The nerve and other tissue of the pulp cavity are removed and replaced with filling material. GENDEX® digital radiographs create high-quality intraoral images, a process that greatly reduces radiation dose to the patient and are used to diagnose tooth decay. IMPLANTS can be used to replace a single missing tooth. First, an implant is placed in the jawbone by an oral surgeon. Bone then grows around the implant to anchor it in place. The patient then comes to our office and, using matching implant hardware, we make a CEREC® implant crown – in just one visit. KÖR® tooth-whitening system is an advanced whitening system that whitens teeth up to 12 shades in an hour, without leaving you with any tooth sensitivity. LUMINEERS® are a contact-lens-thin veneer that can make everyone’s smile more beautiful without removing painful tooth structure. LUMINEERS can correct tooth discoloration, gaps, permanent stains, and broken or misshapen teeth, and it can reshape slightly crooked teeth. SEALANTS are applied to the chewing surface of permanent molars to protect the teeth from decay-causing plaque and acid. The sealant is a clear or shaded plastic material. SILENT NITE® snore-prevention appliance gently positions the lower jaw into a forward position to keep the airway open and prevents the soft-tissue vibrations, which cause snoring. TMJ appliances are used to relieve joint and muscle pain. They act like a shock-absorber for your teeth to relieve pressure on the joint and reduce inflammation that is causing pain. WATERLASE® soft-tissue dental laser by Biolase is a safe and gentle alternative to traditional dental tools used in the removal of diseased, infected and inflamed soft tissue. It can perform many procedures without the need for a shot or a drill. Dr. Dooley will be happy to consult with you on any other services, procedures or appliances you don’t see listed here, from cosmetic dentistry to general or deep cleaning, to specialty or partial dentures. Just ask! The Tooth Fairy was never this good! 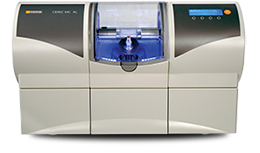 CEREC® stands for Chairside Economic Restorations of Esthetic Ceramics. In the same, single appointment, you can watch as Dr. Dooley and his staff SCAN for, DESIGN, FABRICATE and SEAT your restorations. These are the same high-quality restorations provided by more traditional means (an outside lab), but carefully fast-tracked and made much more convenient onsite by the latest technology and years of hands-on professional education. Dr. Dooley participates in a continuing-education workshop on CEREC technology at the Spear Education dental-training facility in Scottsdale, Arizona, in June 2018.
to learn more about CEREC.